Electron orbit circumferences have to be in multiples of its de Broglie wavelength, but what do those 2 have in common? I will assume you familiar with the properties of waves such as interference and diffraction. 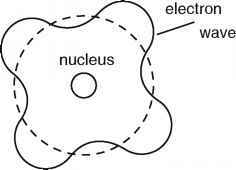 Consider an electron orbiting the nucleus. By de Broglie's hypothesis, we would consider it to be a wave orbiting around the nucleus. Now, once the electron wave orbits once, the second time it would interfere with the first wave. For the system to be stable, that is, the electron shouldn't cancell itself out, so the wave must constructively interfere. That means, the circumference must be an integral multiple of the electron's wavelength. Here's a picture that shows how the electron wave is expected to exist in the atom according to the Bohr's theory. Nothing actually. It was quite a wild guess by Bohr and supplied him with the spectrum of hydrogen. Pretty good guess indeed. De Broglie suggested the existence of matter waves and gave a relation between their wavelength and momentum. He said that this relation is completely general. It can be applied to matter particles and even photons. Bohr, in his atomic model, considered an electron to be in form of a standing electron wave and if this wave is to be continuous over the circumference of the stationary orbit that the electron lie in, the circumference must be a integral multiple of its wavelength $(n\lambda)$. This comes from the Bohr-Sommerfeld quantization formula, which can be derived from the semiclassical WKB approximation of quantum mechanics, cf. e.g. this Phys.SE post. The quantization condition follows from requiring single-valuedness of the wavefunction. Quite new here. Anyways, it was not a guess by Bohr in the first place. And it is so as to save energy else once it'll be out of phase it will start losing energy and Niels quantization will not be valid. That's the logical explanation though still incomplete considering that there's a lot going on and the theory we are referring to is outdated to a LOT of extent. Happy learning! Not the answer you're looking for? Browse other questions tagged quantum-mechanics atomic-physics wavelength semiclassical or ask your own question. Why can't an energy level exist containing 0.9 electron wave wavelengths? Why must it be a whole number? If Bohr model is outdated and we know that there is no such thing as an “electron orbital circumference” then how is $2\pi r=n\lambda$ still valid? Is second postulate of Bohr's theory only for hydrogen? Why does a stable orbit of $H$ atom contain an integer number of de Broglie wavelengths? How does hydrogen emit radiations of diffrent wavelengths and still is called to have line spectrum? Can an atoms energy levels be changed by changing the de Broglie wavelength of electrons?